Arriving at Summit Station. Photo by Courtney Hammond. 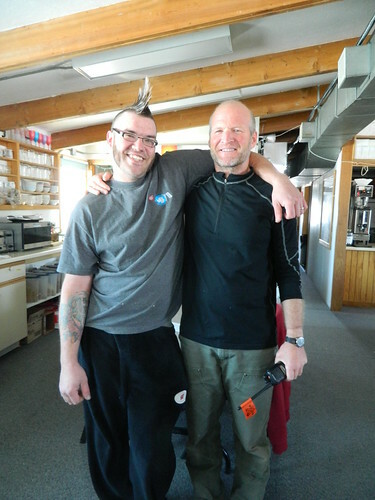 Quentin Watson (left), Chef, and Ken Jessen, Camp Manager. The “Big House” is the center of activity at summit, hosting a large kitchen, numerous tables for congregation, a futon, the manager’s office, and an extremely sunny bathroom (I’ve never needed sunglasses to brush my teeth before). 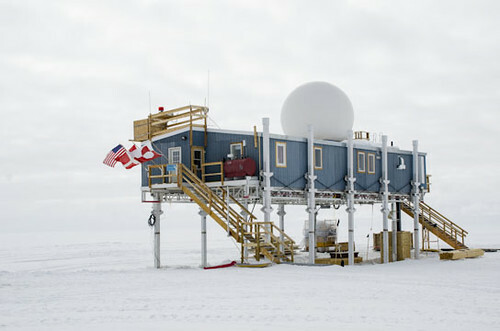 The building sits atop tall, metal stilts, which, on good days, keeps it above winter snowdrifts. When we arrived from our flight, the house was warm and smelled like delicious food—the first of many incredibly tasty meals we would indulge in at summit. After lunch we were given instructions from the camp manager, Ken, about general rules of living/surviving at summit. These rules ranged from making sure to wash hands or use sanitizer before every meal and at every possible opportunity (there was sanitizer conveniently stashed in every corner of camp), to using the highest level of caution and sense at all times, as being evacuated from camp, is, well, highly undesirable and risky. Next, we heard instructions about staying healthy from the medic, Ben, who is a part of the incoming IGERT cohort. After the logistics talks and welcomes adjourned, we were set loose at camp. “Big House” at Summit. Photo by Courtney Hammond. It was vast, silent (save for the tractors moving snow during the day), and white-to-grey, depending on the sky. 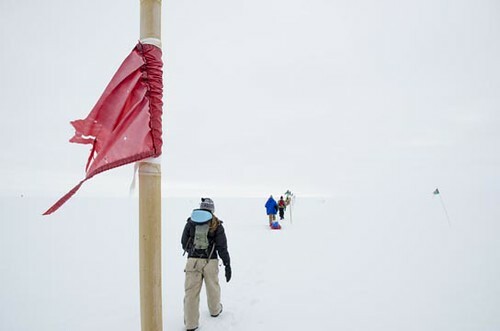 While bamboo flagpoles permeated the immediate area of camp— marking walkways, science equipment, and boundaries—the extent of flat, unadulterated snow past the summit encampment was truly astounding. We had plenty of time to ponder the grandeur of it all while we took turns working inside the pit. To keep warm during our outdoor sampling stints that would last 3-4 hours at a time, we made videos, took pictures, learned a tap dance routine and sometimes trekked back to the big house for a quick cup of tea. The temperature hovered around -18 C throughout our stay, with winds coming and going and the sun ever-present. “Walking into the Expanse” by Courtney Hammond. The transition between nighttime and daytime hours gets blurred at the poles since it is light all the time during summer. 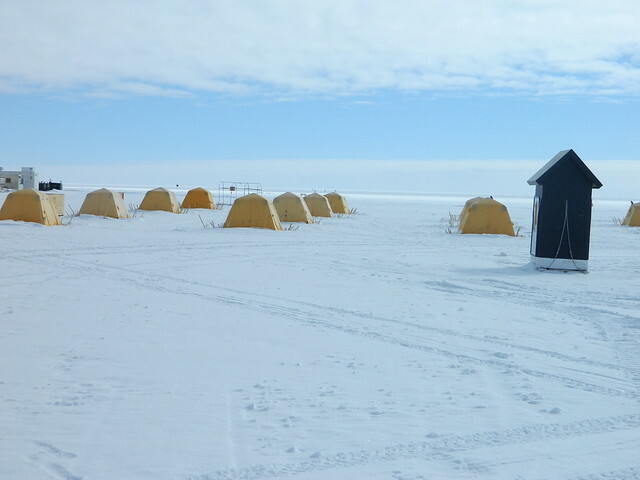 However, the temperature was noticeably colder when I would walk across the snowfield to “tent city” at bedtime. Orange tents in perfect rows are set up at one edge of camp, and researchers and students visiting summit sleep there during their stays. Since we were the only researchers visiting at the time, we each had our own palatial “Arctic Oven,” which has a layer of insulation to trap solar energy during the day. Since our first three days at summit were overcast, we did not have such luxury of a toasty tent at night. My personal sleeping accommodation consisted of a cot, a hot water bottle at the foot of my sleeping bag, a fleece liner, and a -20 F sleeping bag (I may have also put my own zero-degree bag over my cot as extra comfort—psychological comfort, if anything). Between the tent flapping viciously in the wind, the blinding sunlight (it seemed sunnier inside the bright orange tent than out! ), the high elevation, and the bitter cold, sleeping did not come naturally to me on the first night at summit. It was my first night sleeping on the Arctic ice ever, and it was all completely foreign—including the choice method of peeing in a water bottle in the middle of the night as alternative to trekking to the outhouse. By the 3rd night, however, I was STOKED. What an amazing, simple, lifestyle. 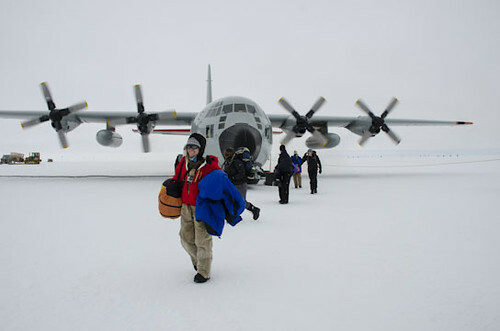 When ‘home’ is a little arctic hut, and the day’s duties include collecting snow and firn samples with the goal of better understanding the Earth’s past climate, a unique rhythm can set in, both individually and within the group. 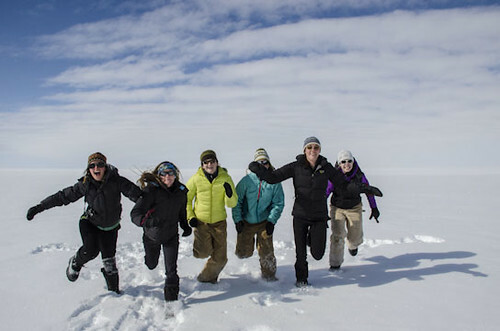 Upon leaving summit, the only illness I feared I was getting was what our professor, Ross Virginia calls “Arctic Fever”—the need to return year after year after year for this totally unsurpassed feeling of adventure, camaraderie and discovery. Excited to be Women in Science. Photo by Courtney Hammond.